This page illustrates how to connect to JAIST Wi-Fi using the digital certificates. #To use this secure network, please download and install your digital certificate in advance as shown in the following link. To connect to JAIST Wi-fi, an imported digital certificate in your windows 10 is required. If you can't find valid certificate in the above certificate window, please refer the following link and download your digital certificate beforehand. Click Wi-fi Sensor in Action Center. Select “JAIST” from the list of wireless SSID names. Check the "connect automatically" checkbox and click "Connect". 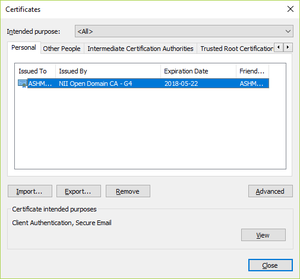 Click on "Connect using a certificate" . If asked select the certificate (you imported shown in the above section). Confirm the messages and click "Connect".